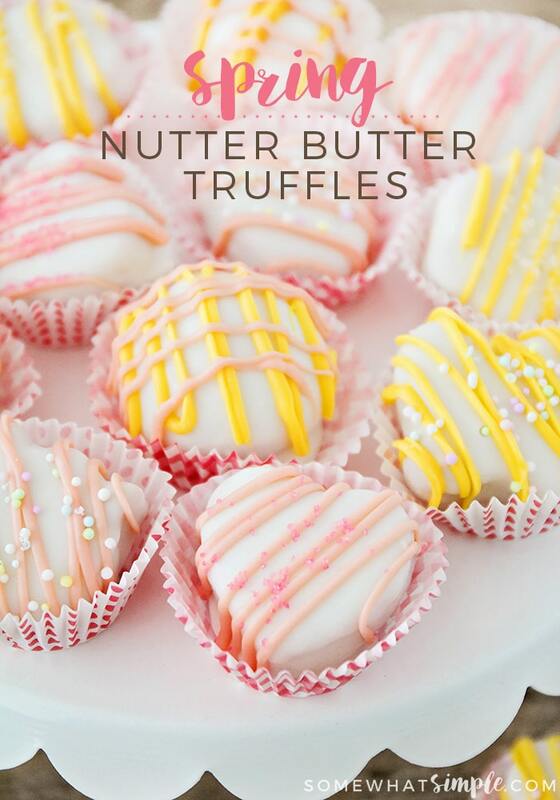 Spring Nutter Butter Truffles – A Simple Treat! 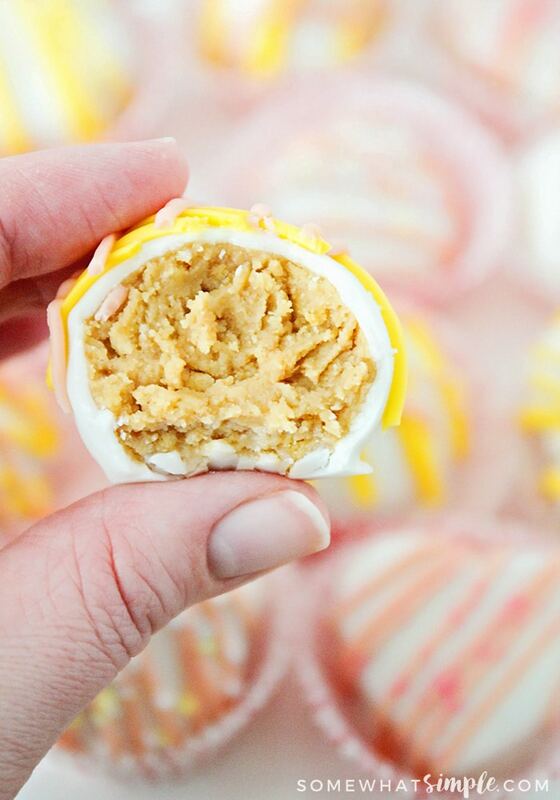 These Spring Nutter Butter Truffles are a fun, EASY recipe that uses just a few ingredients!! We make truffles all the time, and these Nutter Butter ones are some of our very favorites! They are simple to make and taste delicious! They are also easy to dress up for any holiday or season, and I love a good recipe I can make year round, don’t you? Using the paddle attachment, crush the cookies on speed 2 for a couple of minutes. Add the cream cheese and mix until thoroughly combined. Use a medium cookie scoop and scoop balls onto a parchment-lined baking sheet. Roll the truffle balls between your hands to make them smooth and round. 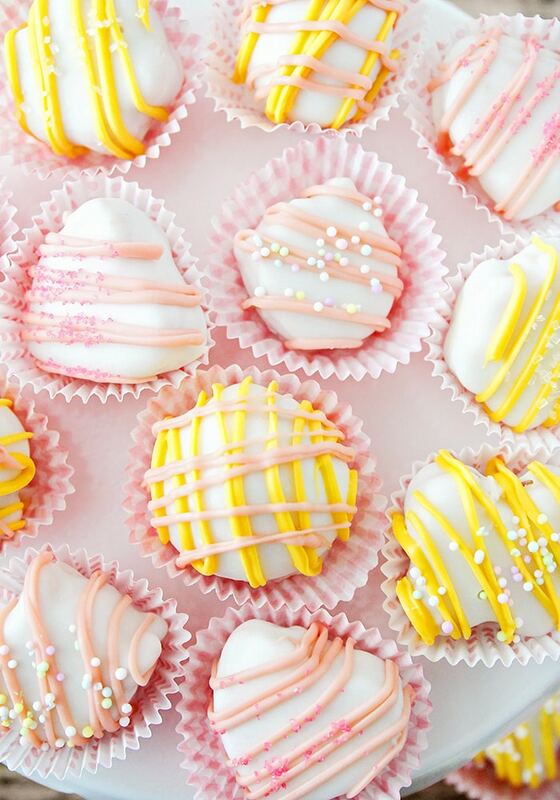 OR, if you want to make fun Spring shapes, roll some dough between your hands to smooth it, then take a fondant cut-out and press it down over the top of the truffle ball. Press the cut-out between both hands so the truffle dough is flush with the top and bottom. Remove excess to use in another truffle. Gently press truffle out of the cut-out. Once all truffles are shaped, put them in the refrigerator for 15-30 minutes to harden. Melt the white chocolate chips and vanilla almond bark according to package directions. Dip your truffles into the chocolate chips and coat completely. If the chocolate cools too much during dipping, warm it again in the microwave for 15 seconds.
. For flat truffles like the flower shapes, use a fork to dip them. The excess chocolate drips through the tines when gently tapped against the side of the bowl. Use a toothpick to gently push the truffle onto the parchment paper.
. For the rounded balls I like to use a spoon (they always roll off my fork!) and then use a long toothpick to wipe away the excess chocolate. 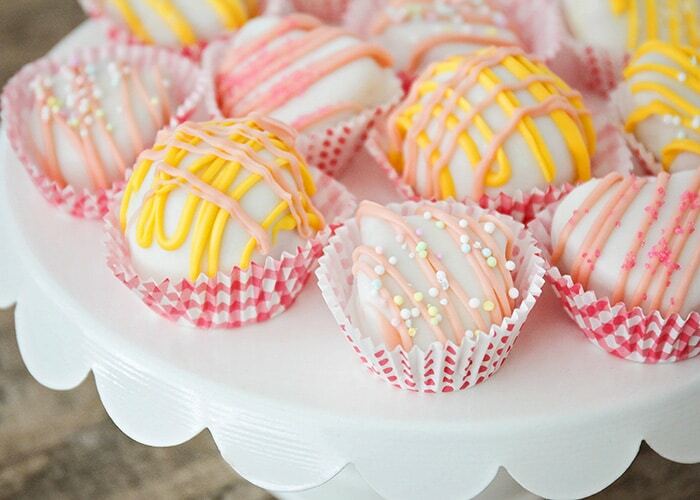 Drizzle with colored bark or decorate with sprinkles while the chocolate is still wet, then place the decorated truffles in a mini cupcake liner to cool before serving. 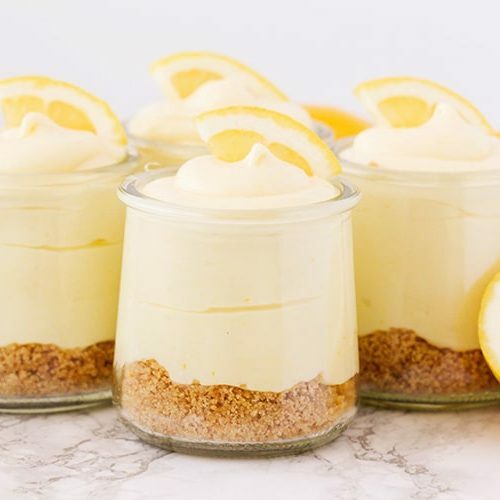 Now you have a beautiful spring treat! 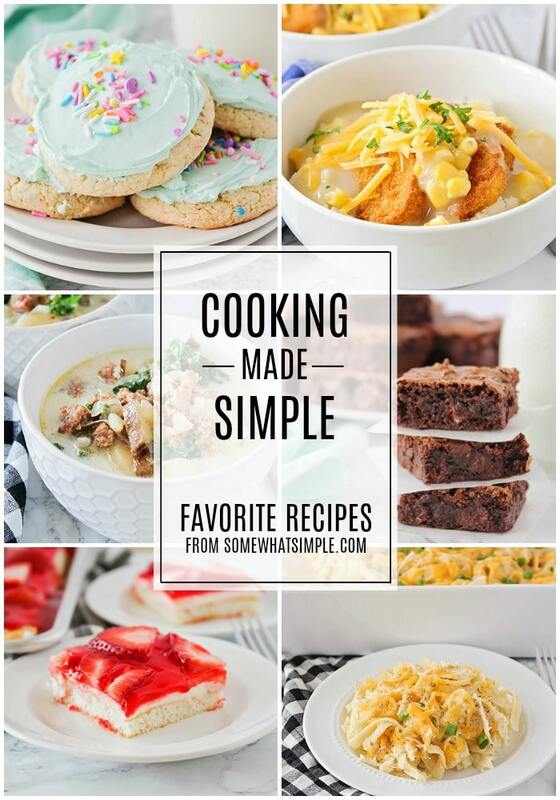 This post originally published on Somewhat Simple in April 2014. Thanks Lisa, you are so sweet!! Hope you like them! we all knew you were awesome . Thanks for stopping by to take a peek…you are awesome! Nice work Becky! You’re going to do amazing things on this website! 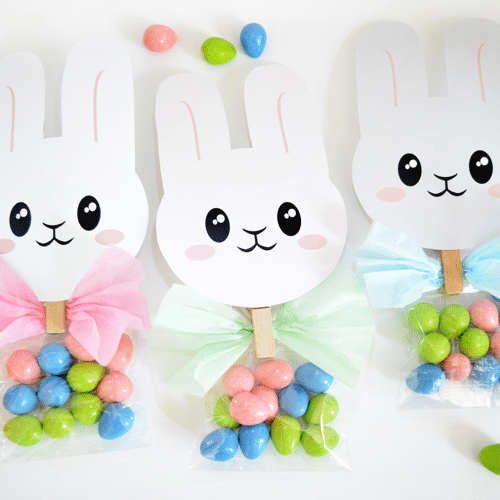 These look yummy and super cute!! Thanks Barbara! I’m still pretty excited about all of it, so glad you stopped by!! Those are beautiful! I can’t wait to try this recipe. I am a visual learner and so I appreciate all the pictures. Looking forward to more posts from you. Thanks Kirstin! Mike liked the ones with sprinkles the best because it gave them a little bit of a crunch. Let me know how you like them! 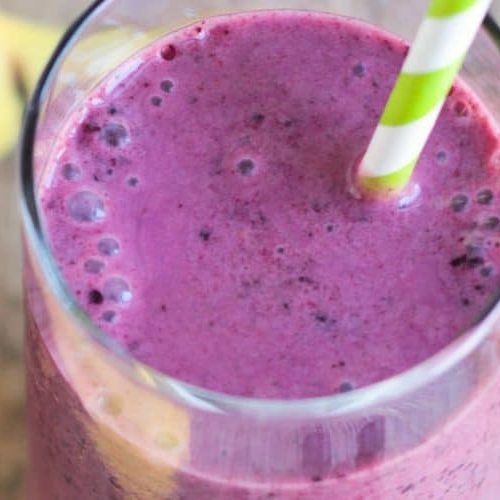 Looks so yummy and easy, which is essential for me! Ha! I’m excited to see what else you’ll be sharing with us! Awesome Becky! This is so exciting! Can’t wait to see your posts and try some of your ideas. Truly, you rock! Thanks Joni, I’m super excited!